The boat cleaning sponge that does it all! Every weekend has been the same since I purchased my first boat. I spend a great amount of time out on the water, and I often take my boat to my favorite restaurant. Living in Florida (most popular state in the US for pleasure boating), it�s actually more convenient than hopping in the car and dealing with traffic! Since I use my boat so often, it tends to get dirty. I�m a lucky guy because I own what is (in my somewhat biased opinion!) the best line of marine care products available � Marine 31. 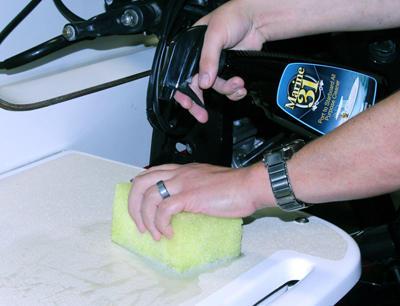 My favorite cool tool for taking care of my boat is the Marine 31 All In One Non-Skid Sponge. Use with Marine 31 Port to Starboard All Purpose Cleaner. Your non-skid has never looked this good! 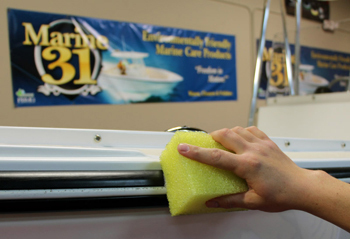 The Marine 31 All In One Non Skid Sponge is the Swiss Army Knife in boat cleaning tools. I guarantee that, if you use this sponge as often as I do (which you most certainly will), you will find at least one new use for it every week. The Marine 31 All In One Non Skid Sponge is that good. I came up with the idea for the All In One Non Skid Sponge because I�m fanatical about keeping my boat clean, as you could imagine with my position as the owner of Marine 31. I tried countless combinations and brushes and cleaners and could not find a quick, easy way to clean the molded-in non-skid on my boat. One day I tried this sponge, and I couldn�t believe how well it worked. I made further improvements to the design and the Marine 31 All In One Non Skid Sponge was born. 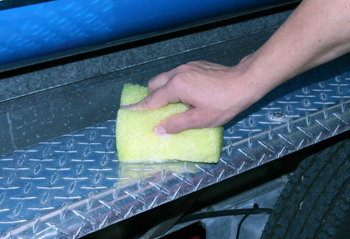 You'll be amazed the first time you grab a hold of the Marine 31 All In One Non-Skid Sponge. It's very coarse and stiff at first, but after you wet the sponge it becomes significantly softer while still retaining the excellent cleaning ability of the coarse, open-cell foam. Don�t stop at your non-skid! The Marine 31 All In One Non-Skid works great for removing mold and mildew stains from durable vinyl, and it can be even be used to scrub stubborn scum line stains. To really get the surface clean, combine the Marine 31 All In One Non-Skid Sponge with my Port to Starboard All Purpose Cleaner. You can thank me later! Use with a metal polish on stainless steel and aluminum!